So what are their key trends going to be this year? Christmas. Yep, there you go, we said it. We know it’s only September but we can’t deny we are already starting to feel festive. And apparently we aren’t the only ones… John Lewis & Partners also seem to have no chill when it comes to Christmas, as they are opening their always highly-anticipated Christmas shop at the flagship store on Oxford Street, London... 96 days before the big day! So what are the highlights this year? Oooh, sounds magical. And, actually, what is more magical than a room filled with 60 different coloured glass baubles, 30 different colours of tinsel and over 136,400 twinkling coloured lights? In case you hadn’t guessed, techno-colour definitely seems to be their key Christmas trend this year. If you spend the majority of Boxing Day rifling through empty wrappers in the Quality Street tin trying to find your favourite, you are going to love this. This year, John Lewis & Partners have partnered with Quality Street to offer customisable tins, where you can fill up your tin with your favourites only. Sadly, you can’t just fill the tin with green triangles (dammit), each tin has to have at least three varieties, but still, no orange creams or toffee pennies? Sounds good to us. 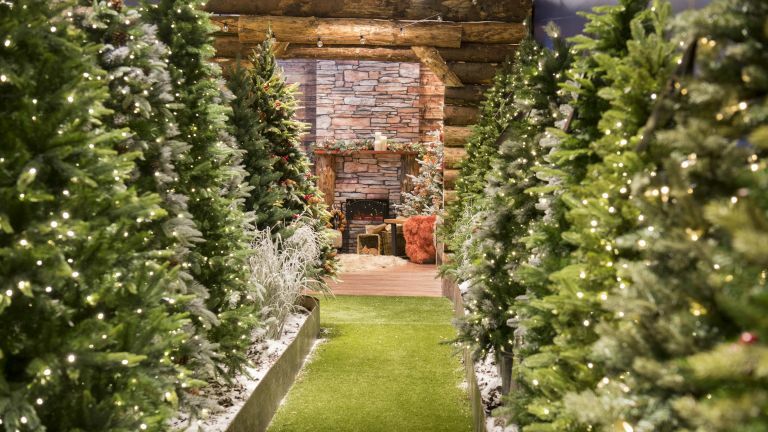 Who knew that an Alpine forest, complete with cosy log cabin, could exist in the middle of Oxford Street? The Christmas Tree Forest is made up of 55 different trees, and not all of them are artificial – it also features feature two new real British grown varieties, ‘The Rocky Mountain Fir’ grown in Oxfordshire and the ‘Korean Fir’ grown in the Scottish Borders. This year is all about gin. Inspired by the UK’s ongoing love affair with the tipple, John Lewis & Partners has teamed up with with premium tonic brand, Fever Tree to offer customers bespoke Gin & Tonic Christmas Crackers. You will be able to choose from eight ‘perfect pairing’ cracker combinations from a variety of iconic gin brands including Edinburgh Gin and Tanqueray, teamed with Fever Tree's six tonic flavours (including the delicious sounding, limited edition Clementine Winter) to create the perfect gin-inspired gift. John Lewis & Partners Christmas shops will open in all branches across the country from 21st to 28th September. The full range of Christmas products can be found online at johnlewis.com.